Well, Matt and Alice have pulled another one off with a momentous occasion for Leicester and the very first Leicester Beer Week… a Meet The Brewer with the ground-breaking, first of their kind Mount Saint Bernard Abbey and the exquisite Tynt Meadow Trappist Ale. 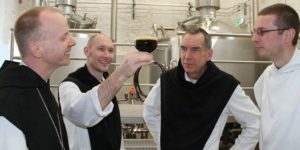 Meet the brewers, the monks themselves, taste the beer and learn all about Monastic brewing traditions, styles, history and what makes this beer a huge moment for English brewing history. Tickets available through Eventbrite and the ticket price includes a free, beautifully branded Tynt Meadow glass.